Have you ever seen a model railroad at a friend's house, at a show or hobby shop? After the Wow! factor sunk in, I'll bet the next thing you were thinking is how neat it would be to have your own railroad to enjoy and operate. It's exciting to think about - developing your own empire right in your own home - an artistic, working, operating masterpiece that you created. You can enlist the help of your friends or family, or you can create the whole thing on your own and then invite them in for an operating session. You could go there by yourself after a long day of work and "get away from it all". Model railroading is the most versatile hobby in the world. It incorporates multiple disciplines including history, civil and mechanical engineering, carpentry, electrical wiring and circuitry, digital command control, sound and lighting, painting, airbrushing, various kinds of artistry, using multiple types of material to create structures, terrain and scenery. The model railroader essentially becomes a jack of all trades as he works in a "labor of love" to create his or her dream. These pages were conceived and written to help put together whatever I have learned in 20 years of experience in working with model trains and train layouts - along with the experiences of many others who have shared my passion - in order to provide you with all the information, tools and techniques you need to build your own realistic, artistic and fully operational model railroad empire. As you look through this guide, I hope you will become excited and impassioned to start your own layout or, if you already have one, to enhance it with the tools and techniques you find here. My mission is to make this the best site available as a resource to help you build the best model railroad possible. This site is supported by donations (here and on the Blog Page) and by advertising from Google, Amazon, eBay, All-Posters and others. If you find this site useful, Please consider using these links or the ones on the Supplies Page to make purchases. I hope you will feel free to send me your comments, questions, additional tips or any suggestions you might have that may improve the quality and/or quantity of information available here. Submit an article to post here if you like. Or, if you would like to see more information on a particular topic, I will try to make that happen. To easily get to the Comments Page, you can click on "Comments" in the Navigation Bar on the left side of every page. The Navigation Bar at the left and the Table of Contents listed below contain the main categories of pages available on this site. There are many other pages on the site that are accessible through the links in the text on the main category pages. The Sitemap contains links to all the pages on the site. Also, wherever you happen to be within the site, if you want to search for a certain topic, you can click on the Search Page in the Navigation Bar. This page has search engines not only for this site, but across the internet as well. Don't forget to bookmark this site to your browser so you can return here quickly whenever you need to look up something or see what's new. Also, there is a shortcut to typing the URL. Who wants to type out www.building-your-model-railroad.com all the time? Try this: bymrr.com when you want to return here and can't find the bookmark. I hope these user-friendly features will help you find the information you want quickly. However, if you just want to browse around the site, that's okay too. If you are a beginner, the first 8 or 9 buttons on the Navigation Bar may be the most useful to you in the early stages. If you are more of an intermediate or advanced hobbyist, you may be more interested in the Special Effects category. The Resources Page is a great place to see what else is out there. It contains a listing of lots of books, magazines and informative websites that have been helpful to me along the way. There is also a section of the page with a list of favorite places to get supplies if your local hobby shop doesn't carry what you need. If you wish to learn more about specific model railroading topics, you may want to look over a collection of Model Railroad Books that are available at Amazon.com and at many of your local hobby stores. If you have your own website and want to link to this page from there, check out the TIP in the tan-shaded table below. Finally, I would sincerely like to thank you for visiting. I hope you will find that this site has been designed with you, the viewer, in mind. I do have a few ads here and there, but I have tried to keep them from getting in the way of obtaining the information you need, and I have tried to avoid using anything that I thought might be annoying. The vast majority of the ads are content-related, and, wherever I have had a choice in what shows up in the ad, I have tried to make it something that I think will be useful and helpful. Above all, this site is intended to add to your enjoyment of the "World's Greatest Hobby". Have fun! New site pages, additions, pictures, comments, article reviews and new techniques relating to building model railroads. Sitemap for Building Your Model Railroad - Navigate to any page on the site with one click. Search page to find anything on or off this site about model railroading. 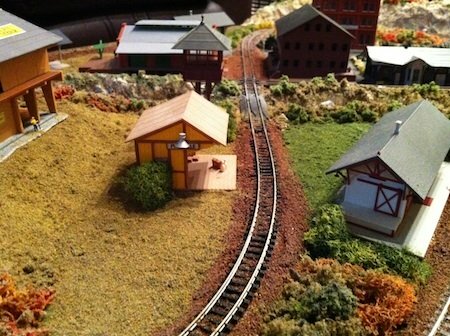 The basics of model railroading, including descriptions of model train scales, types of model train displays, and how to get started in the "World's Greatest Hobby". The NMRA ( National Model Railroad Association) establishes standards for model railroading. Description of the most popular model train scales. Helps in deciding which scale to use for your layout. Various types of model railroad software are available which may be helpful for developing actual or virtual layouts. Various types of model railroad track plans that could be incorporated into your layout. This page contains all the ins and outs about building a basic model railroad yard for your train layout. Various aspects of model railroad lighting, including overhead lighting, sunset lighting, illuminating buildings, street lamps, etc. How to make a model railroad backdrop. All aspects of building and developing model train scenery, including creating terrain and rock formations, tunnels, ground cover, trees, roads, water effects, etc. Information and resources to help you in choosing appropriate model trains, including different types of locomotives and rail cars, for your model railroad layout. Basic weathering techniques for model trains and model railroad buildings. Model Railroad Operation: A New Adventure! How to conduct sessions for model railroad operation. How to create special effects for model railroading and other new ideas. Tips on sound and lighting effects, animation, signal systems, mirrors, fire and smoke, automation and other details. Building a trolley layout is another facet of this wonderful hobby that can provide loads of enjoyment for the young and old alike. Here's how to get started. Garden trains are a great way to involve your family in model railroading. Step-by-step creation of a small N Scale model train layout - A great way to get started, or if you just want to take a break from the big layout. Railroad history is an important part of model railroading that helps inspire us to do what we do. It also provides a reference for us whether we freelance or model the prototype. This is a chance for you to showcase YOUR model railroad with a whole webpage on the internet dedicated to your layout, diorama, structure-building, kitbashing or other projects. My train layout represents an example of what you can do with the modeling techniques described on this site. Where to find more information about model trains and model railroad supplies, the best resources and references. Share your own model railroading tips and comments to help other model railroaders improve. We all have model railroad stories we could tell - some funny, some not-so-funny, but maybe educational. 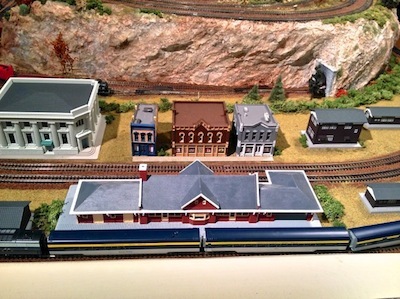 If you have a story to tell about your model railroad experience, let us know about it here. 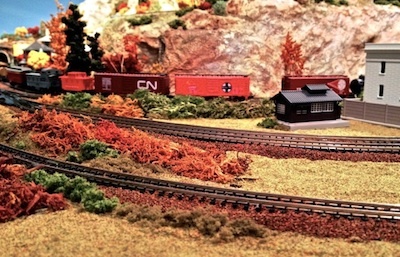 Blog-It: Use this page to send in a model train story, picture or event or anything else related to model railroading. It will appear as a blog enty within the next few days. Describes the basic process of building a website for your model railroad club or to display your own train layout, and what's required to accomplish this. Many of the model train supplies that you will need to build your model railroad can be found on this page. Over 150 pages of information, tips and techniques on this site! like Beginner's Guide to Model Cars.